ADA Wheelchair Accessible Park Grill, 300 Sq in. Swivel Cooking Surface, 3/16" Steel Body, 80 Lbs. Picnic Furniture has the best selection to meet your BBQ needs. 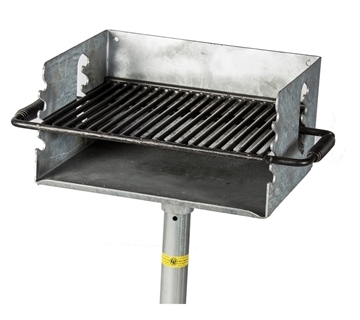 We provide commercial quality single pedestal grills manufactured with adjustable grates and heavy-duty fireboxes. Offering grills that burn both wood and charcoal as well as surface and in-ground mounting options. Featuring pedestal grills with fireboxes that swivel 360 degrees for optimal wind control. Crafted from durable welded steel that's coated with a heat resistant enamel paint, ensuring to last for decades in the most demanding outdoor environments with little maintenance required. Our single pedestals grills are perfect for barbequing at national campgrounds, local parks, and any other outdoor picnic areas. Picnic Furniture's single pedestal grills are proudly manufactured in the USA with a commercial warranty provided. Picnic Furniture grills can be found at parks, apartments, housing communities, and campgrounds nationwide. These heavy-duty grills are constructed with durable materials that allow patrons to cook hot dogs and hamburgers for years to come. We provide grills with or without a flip grate, as well as ADA grills, group grills, and galvanized grills. Contact our friendly staff today for a quote and quantity discounts.